When a legendary London skate park which occupies a unique location under the infamous Westway, starts to show signs of wear and tear, it's an opportunity to switch stance and do something pretty special. 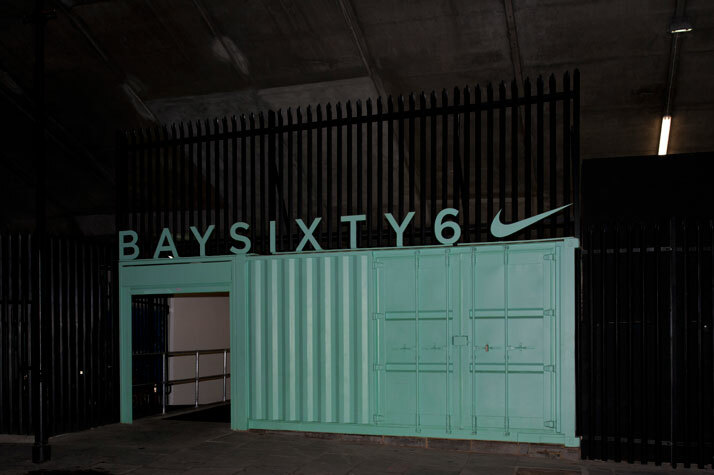 With financial backing from Nike, Brinkworth have done just that, completely revamping the popular BaySixty6 Skate Park with spectacular results (65-66, Acklam Road, W10 5YU London, UK). This iconic skate park, owned by Paul MacDermott, has become a fundamental part of its stimulating West London urban location, with trains thundering past and cars whizzing overhead. Brinkworth have emulated this electrifying atmosphere in a fresh new master plan that's realised the potential to create the ultimate urban skate park.Briefed by Nike and appointed by brand/event agency Urb Orbis, Brinkworth were presented with a unique opportunity to help resurrect this skate park collaborating also with arguably the world’s best timber skate park designers and builders, Michael Groenewegen and Croyde Mirandon of SkatePark Amsterdam. 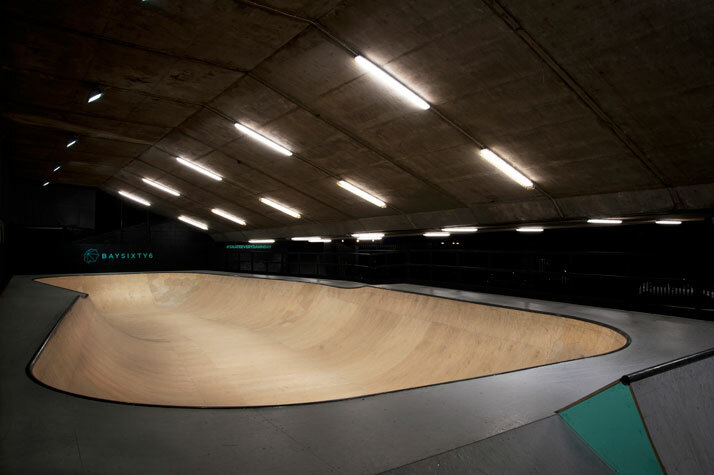 Now the skate area has been fully maximised, infinite opportunities now exist that will exhilarate skateboarders and fans of all levels and styles, whilst also catering for the wider community. BaySixty6 now boasts a functional yet awe inspiring design and is definitely set to attract more and more people to the sport. 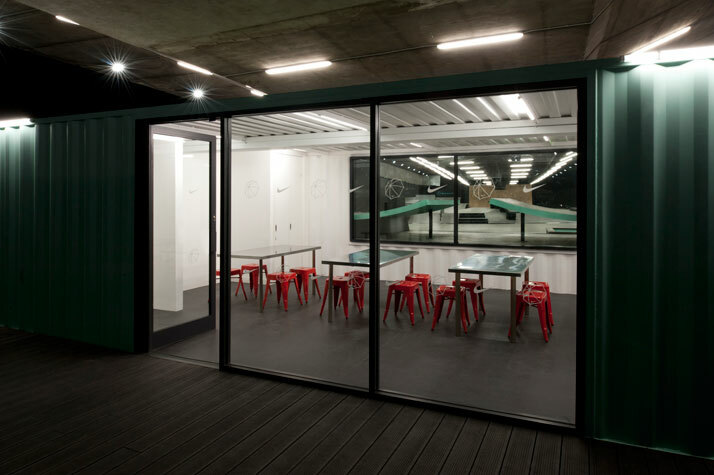 To complement the vast improvements in the skate-able areas, Brinkworth developed the facilities to further include a retail space, a classroom and canteen. These new areas are strategically positioned around a central courtyard clad in recycled decking with bench seating, where visitors can congregate to socialise or unite as part of organised events. 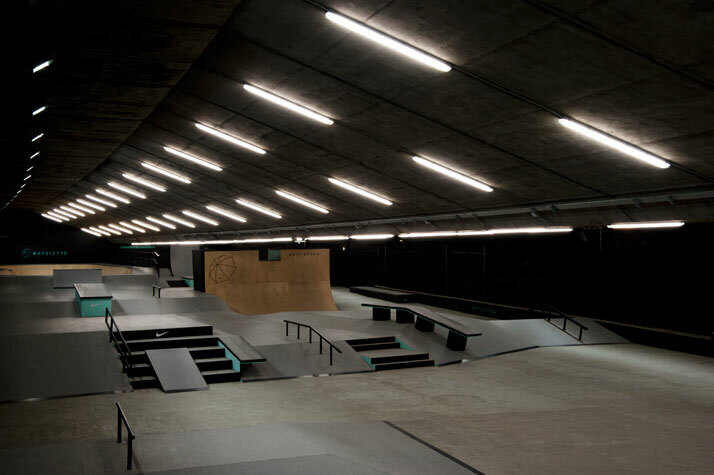 The clean and utilitarian space is flexible acting as a blank canvas to host future events and exhibitions, such as premier skate films or exhibitions. Brightly painted green shipping containers offer both a colourful and robust solution for housing the new classroom and canteen. 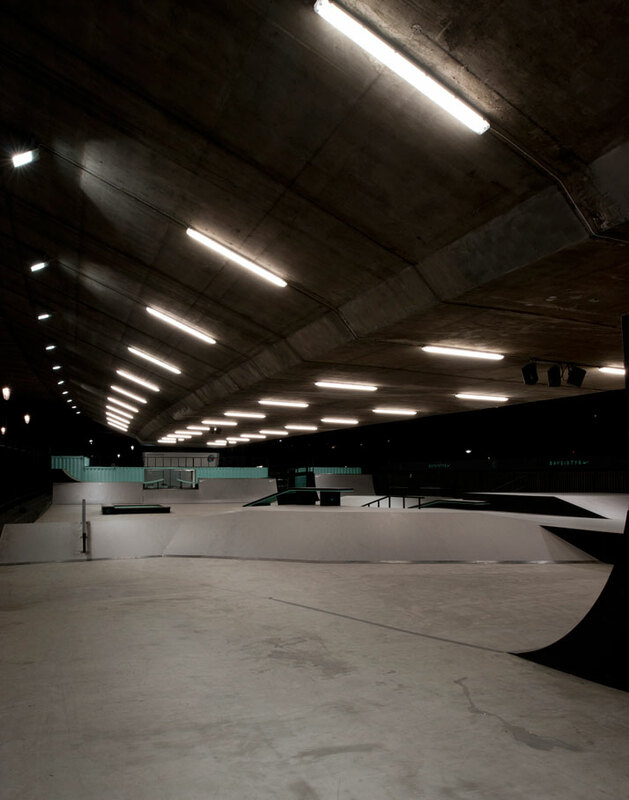 Positioned so as to back onto the ramps with a window framing sightlines down the spine of the skate park, they provide an ideal shelter for spectators in all weather conditions. The design of the park is both striking and bold as well as highly functional. A graphic approach to lighting sees white fluorescent tubes follow the contours of the dramatic concrete underbelly of the Westway overhead which light up the skating concourse at anytime of the day or night. The notion of protection and cover provided by the Westway is also captured in the brand work developed by Wieden + Kennedy in the form of a very British umbrella enjoyed in various areas of the park such as at the entrance also complimenting the ride able spaces. Groenwegan and Mirandon have introduced some impressive and unique interchangeable features to cater for all skating levels. 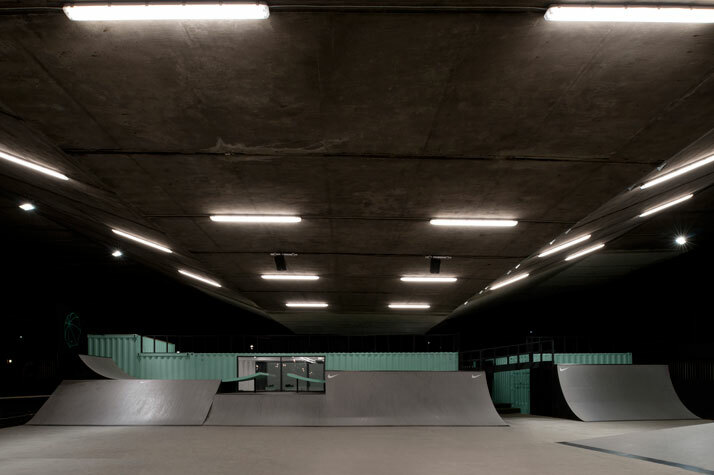 For example, the hydraulic box, which allows the height to be adjusted at the push of a button – meaning it can be set to suit any level, and a kick-ramp situated in front of the canteen window providing spectators with an exhilarating snapshot of the skaters whizzing by. Michael and Croyde’s innovative impressive bowl with its hexagonal design with beech flooring suffice it to say, offers skaters the smoothest corners and the sleekest ride possible. Stepping into this park it’s hard not to gasp at its refreshing style and sense of quality. The overall approach is invigorating and hones in on attention to detail. The consideration behind the design has resulted in the creation of a park that can be enjoyed and utilised by everybody to maximum effect. 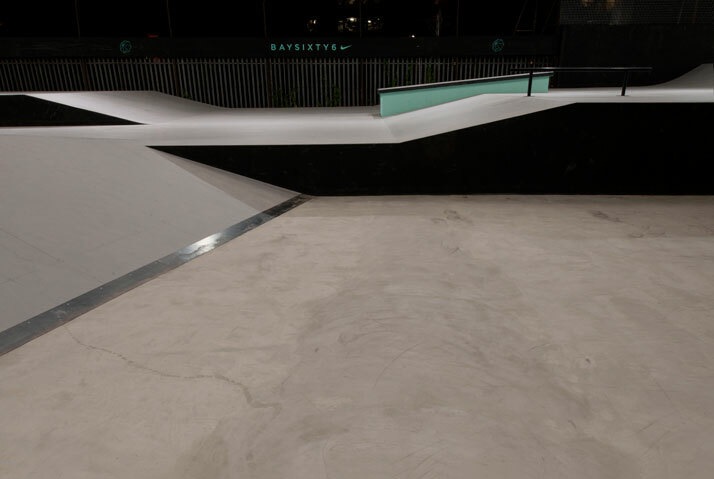 Ultimately, Brinkworth’s design has seen BaySixty6 transformed into an inclusive and stimulating skate park, ensuring its legacy will continue to inspire generations.